Macbeth is the Shakespearean play actors and directors are most superstitious about, but I wonder if Lear might be gaining on the ol’ Scottish play as far as live recordings go? 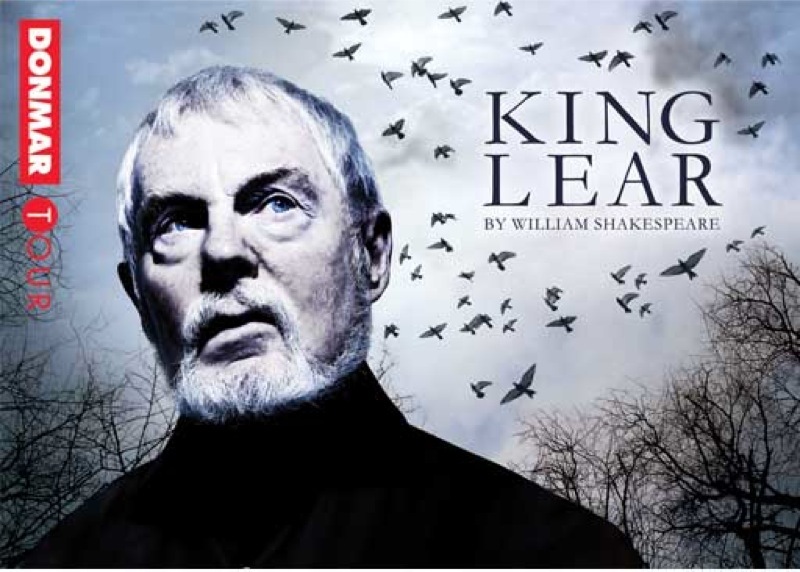 The most famous instance of technical mishap in other otherwise fairly seamless NTLive series remains Michael Grandage’s 2011 production of King Lear at the Donmar Warehouse, starring Derek Jacobi. I didn’t see it, but in a much discussed snafu the picture transmission went dead at one point, leaving cinema audiences listening to the production but looking at a black screen. The stage manager eventually had to come on and stop the performance while the technical team fixed the satellite link, at which point the company took the scene again from the top. The incident caught people’s attention not so much for the technical failure in and of itself (surely things like this are bound to happen at some point), but rather for the way it raised questions about who the primary audience really is in a live theatre relay. 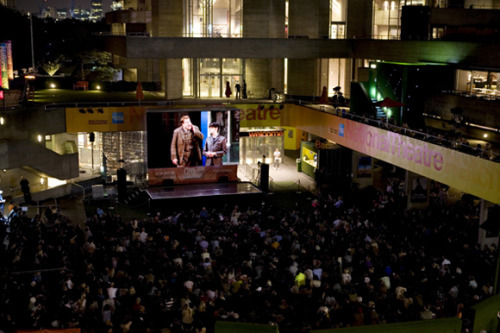 We might imagine that the ‘real’ audience during a broadcast remains the couple of hundred people live and present in the theatre, but in fact doesn’t it have to be — and indeed shouldn’t it be — the several thousand people live and present in the cinema? This past Thursday the NTLive series featured another King Lear, this time produced by the National itself and featuring director Sam Mendes and actor Simon Russell Beale back together again in a continuation of their longstanding Shakespearean partnership. I found a lot to like in this production — in particular Beale’s very naturalistic, even medicalized interpretation of Lear’s madness, and Kate Fleetwood’s stunning realization of Goneril’s barbed vulnerability — but I want to briefly reflect on this production’s own set of technical hiccups. They were in no way as significant as the 2011 incident mentioned above, but they still produced moments in which the broadcast drew attention to itself as a filmic mediation, chiefly due to a few instances of things going wrong. The first happened during Kent’s altercation with Oswald (I think in 2.1 outside of Gloucester’s, rather than 1.4 at Goneril’s, but I’m still getting used to taking notes in very dark cinemas…). Somehow Kent’s body mic must have been moved or damaged in the stage fight, resulting in a heavy sound distortion and crackling that producers quickly switched off. The sound mix was as a result much quieter for a short period of time following this, though I wouldn’t say that it significantly impeded the ability of the cinema audience to engage with the production. I did wonder though if this hitch caught the production team off guard and led to the problems that followed, or if it was all just coincidence. When Lear and the Fool arrived at Gloucester’s castle to find Kent in the stocks, the Fool sat with Kent at the bottom of a demagogic statue of Lear for some of their bantery lines. The camera started to pan beyond the two of them (perhaps thinking that the Fool was going to move that way? ), then hesitated, and then zoomed from mid-shot to wide-shot very suddenly, getting everyone centered and back in view. Later in the same scene, when Lear pleaded with Regan over her involvement in Kent’s punishment and his own treatment in his daughters’ households (‘No, Regan, thou shalt never have my curse…’), the camera again started to pan in one direction, halted, then scooted back quickly in the other. And finally, in the production’s harrowing, closing scene, some body mic trouble re-emerged as Lear pulled Cordelia’s lifeless body to him, muffling and thumping the sound of his final speech in the process. I’d say these were all small moments of confusion, though, and if anything they served to remind audiences that these broadcasts are indeed live, and vulnerable to occasional difficulties. They really didn’t bother me — in fact, I found the confused camera pans strangely endearing — but I have noticed people talking about them in the aftermath of the broadcast, which has in turn meant more discussion of the broadcast itself as a technical and creative event (rather than as a transparent medium through which the theatre production is realized). My personal opinion is that the overall broadcast was not that dissimilar from the other NTLive work I’ve seen — at the risk of banging on about the same point in these posts, I found that the camera work frequently divided the staging up more than I’d like, using mid-shots and close-ups to push us into a particular character’s finely detailed psychological world but at the expense of cutting other important exchanges and spacial relationships out. When Lear started to deliver his ‘I am ashamed / That thou hast power to shake my manhood thus…’ speech in Goneril’s home, it was not clear to me until nearly the end of the speech that his daughter was still on the stage. When Edgar told us that his ‘country gives [him] proof and precedent / Of Bedlam beggars’ wandering the countryside, we could vaguely spy a crowd of destitute men emerging in the background, no doubt composed from this production’s very ample cast, but any larger scenic effect was lost. And when the storm on the heath finally shook Lear’s world, the camera divided up the exchanges between the different characters in a way that made the composite use of the stage very hard to imagine — in my notes I jotted down that the ‘camera work breaks the stage apart, turns it into a set’. Still, there were moments of brilliant composition that I wouldn’t trade. The close-up on Lear and Gloucester in the Dover scene, when Lear finally addressed his companion soberly and directly (‘I know thee well enough; thy name is Gloucester’), allowed us to witness the full range of Stephen Boxer/Gloucester’s devastating reaction. In a very different mode, the crane shot that swooped down to Gloucester as he stood on the ‘cliff’ was absolutely stunning — it offered a sense of the vertiginous beauty and terror that we might imagine while reading the scene, but that can be very difficult to create on the stage. Though I haven’t yet seen this Lear on stage at the National, I’d wager that the filmic very likely exceeded the staged in these moments — but I’ll refrain from speculating any more until I have the chance to test this hypothesis at the end of this month. I suppose what I’m saying overall is that this Lear showed the kinds of strengths and weaknesses that for me have been present in other NTLive broadcasts, but also that its more explicit technical hitches brought attention to it as a broadcast in a way that I think is productive. 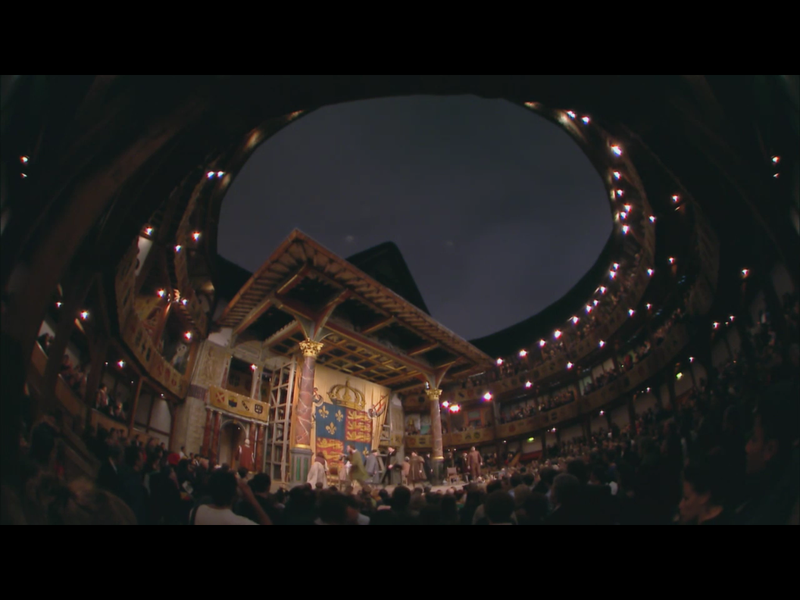 Like the 2011 Lear showing (re-edited for Encore performances and also the NT archive), it offers us an interesting case of how these broadcasts work, not just in the filming itself but also in the reaction to it. 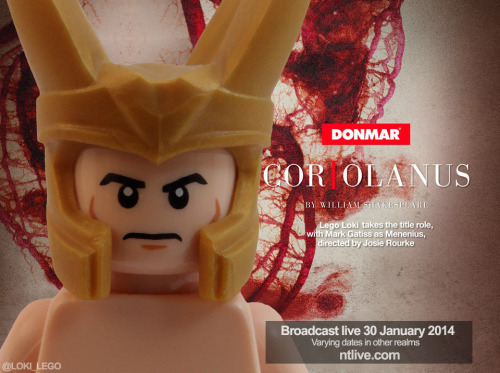 Like thousands of other people across the UK, in January I made my way to my local cinema to see Tom Hiddlest— er, Coriolanus, broadcast live from the Donmar Warehouse to the silver screen. The Donmar is a small theatre – 251 seats, according to my A4 programme – so it’s not unusual for it to sell out, but it doesn’t usually do so so quickly, and so entirely, as it did for this Shakespearean production. I knew going into the show that people liked Tom Hiddleston, apparently dubbed ‘the sexiest man on the planet’ by MTV (as we were reminded in the interval programming), but I didn’t know quite how much. I was lucky to see him live in 2006 in Cheek by Jowl’s The Changeling, and then again the following year as both Posthumus and Cloten in their Cymbeline, before his star ascended and tickets to his productions turned almost literally into gold dust. He was excellent in both shows, and in particular Cymbeline, where he had more to do and his doubling of the male leads added to the surreal, maze-like quality of that strangely charming play (not to mention that he made Cloten a lot more attractive than is usually the case). This time around, Hiddleston was undoubtedly the main draw, and again he made a typically taciturn character – Caius Martius, later Coriolanus – into a suppler, more emotionally rich figure than we have perhaps come to expect. 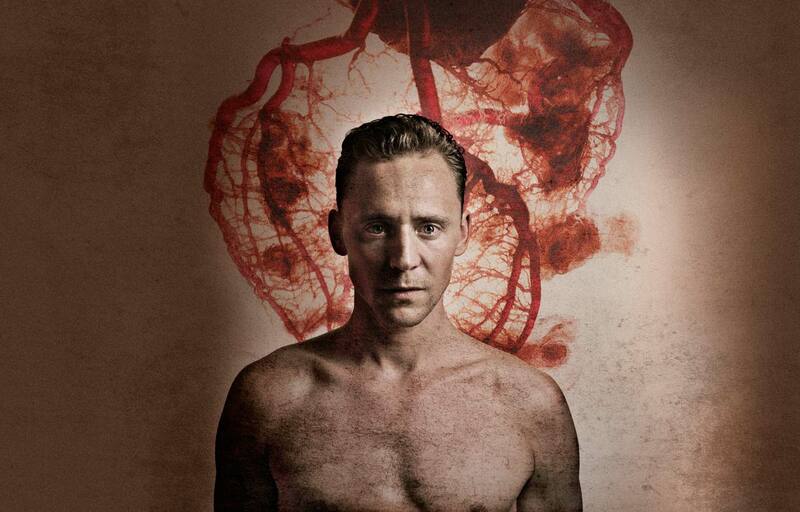 For me that interiority was achieved against the grain and even in spite of Shakespeare’s text, the result being that Hiddleston’s supremely watchable and even enthralling performance could never be a definitive Coriolanus for me – not enough sneering violence, not enough sociopathy. He was still great, though, and I’d love to see him as a Brutus, or even a Hamlet, in the years to come. 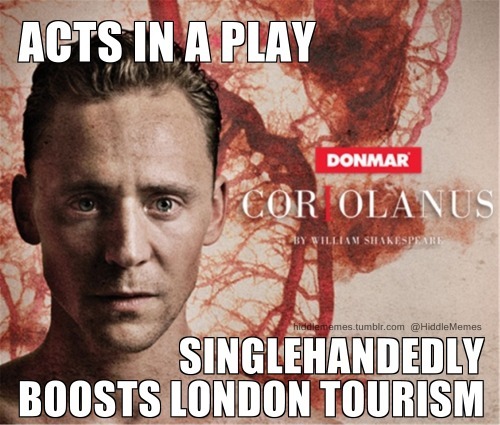 For someone interested in the relationship between the filmed and stage version of this production, Hiddleston’s involvement provided an interesting test case. His celebrity itself blurs the boundaries of theatre and film, encouraging audiences from one realm to enjoy the delights of the other. 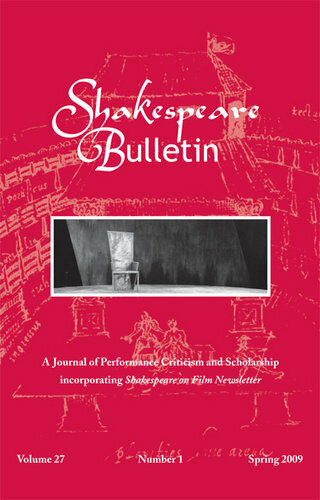 More than a few newspaper reviews of the production noted the youthfulness of its audience, the implication being that this Coriolanus helped generate interest both in Shakespeare and in theatre among groups more typically drawn to blockbuster cinema – and if that is true, then all the better. 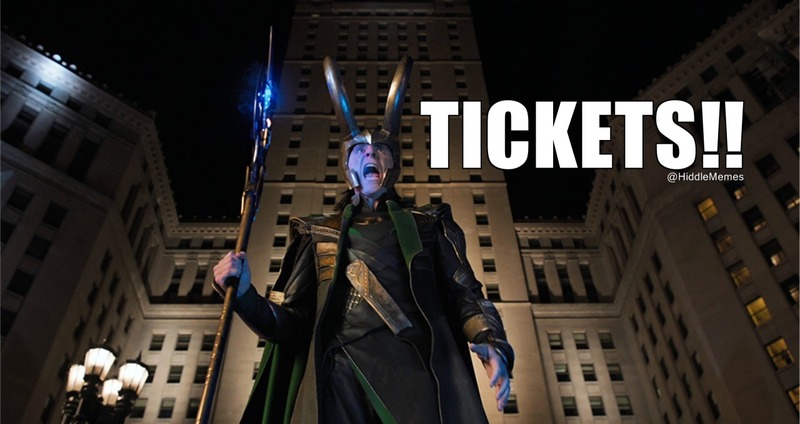 On a much more practical note, though, Hiddleston being in this show meant that there was no way in hell I was going to get a ticket to it, and that I was one among many in such a situation. Live broadcasting to cinemas becomes all the more pertinent in such circumstances. 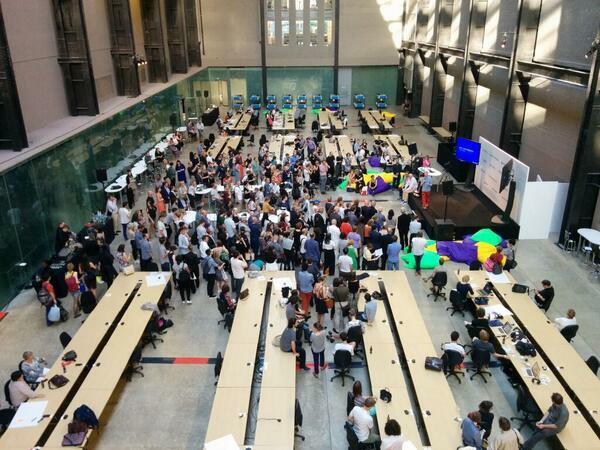 With demand far exceeding supply, new possibilities for access to the production meet a clear and demonstrable need. My cinema in Stratford-upon-Avon was filled to the brim, with at least two ‘encore’ screenings to follow, and I wouldn’t be surprised at all if most other cinemas broadcasting it across the country were met with a similarly fulsome crowd. The remarkable demand for tickets for this production, however, means that any discussion for me of the broadcast itself must be limited to that – the broadcast alone. And it was an interesting one. To date all of the broadcasts and live filmings that I’ve seen of Shakespearean productions have been from relatively large, spacious stages, often with a very strong sense of place: the Globe in London (Henry IV parts 1 and 2, Globe to Globe), the RSC mainstage in Stratford-upon-Avon (Richard II), the amphitheatric Olivier at the National (Othello), a highly atmospheric, reclaimed church in Manchester (Macbeth). The Donmar, with its intimate scale and spare black-box of a stage, is a markedly different kind of space, and not one that necessarily lends itself to visual tableaus or epic camera sweeps. What would the screened experience be like? The first indication we got of an answer came in the form of an overt Brechtianism that was starkly distinctive from the more pictorial setting evoked at the start of the RSC’s Richard II in November. Young Martius ran on with a paintbrush splashed with red and swiftly drew a large square outline around the stage-space, a bloody chalk circle of sorts. Inside was a single vertical ladder, behind a set of empty chairs and Roman graffiti projected on the back wall. But while these physical features may have gestured towards a Brechtian theatre of alienation, or even the German playwright’s own staunchly socialist reworking of the play in the 1950s (retitled Coriolan), neither possibility evolved into something more significant once the production really got going. Instead, in the play’s opening scene we encountered a chaotic, disjointed mob, angry in their demands and reckless in their threats. 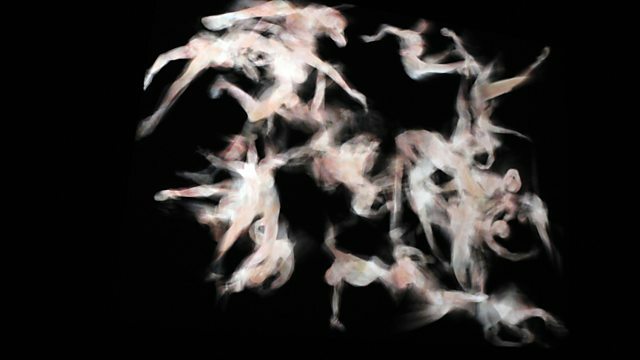 The camera moved rapidly, coming at the actors from all three sides of the Donmar stage, with the swift and sometimes dramatic cuts between different angles adding to a sense of frantic divisibility. This was in no way the ordered, noble citizenry assembled at the start of Brecht’s play, but rather a disgruntled fringe spurred on by a particularly aggressive First Citizen, whose longer speeches were cut (‘We are accounted poor citizens…’, ‘If the wars eat us not up, they will…’) and whose belligerent, bullying lines were accentuated (‘Let us kill him!’, ‘He did it to please his MOTHER!’). Very little camera time was offered to either Citizen Two or Three, and once Menenius/Mark Gatiss/Mycroft entered the stage the focus turned resolutely to him and his mincingly triumphant, if heavily curtailed, belly fable. 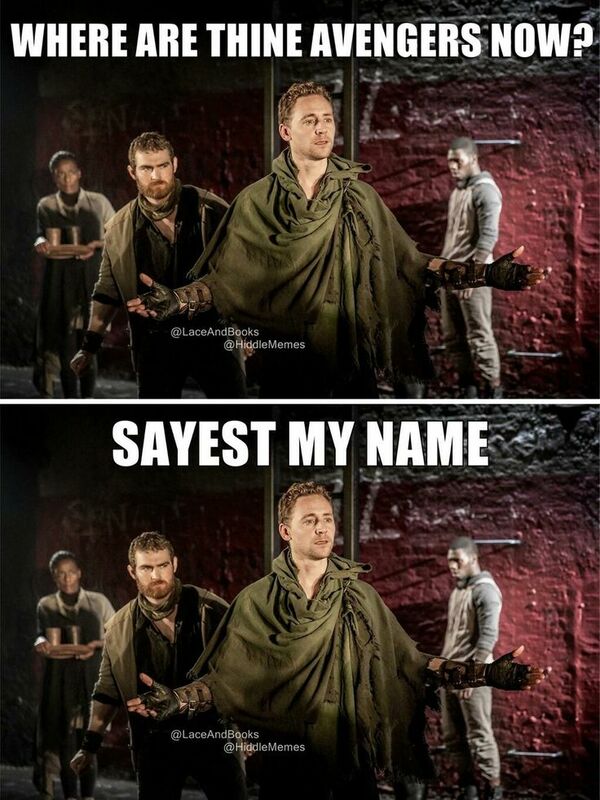 Until, that is, Caius Martius/Tom Hiddleston came into the scene – and all the cuts to the preceding action meant that his entrance occurred easily within the first ten minutes of the show, perhaps even the first five. With the camera fixed on him, and the three citizens positioned at separate corners of the square stage, Martius was alpha dog to their skittish, ineffective pack – the un-unified, undignified ‘fragments’ he imagines them to be. When he scornfully announced that they would be granted tribunes to represent them, they whooped and hollered on stage, but to no clear political end. The victory seemed to be more in winning itself than in the gain of any real power or authority. In terms of the filmic style, the chief visual mode for this production was no doubt the close-up, and what’s more the close-up from many angles. I counted upwards of 42 changes in the sequence that leads to Martius’ banishment, which probably occurred over roughly 80 lines in performance. This meant that we were averaging close to one camera shot per 1-2 lines, the result being a very directed point of view. Not long after attending this broadcast I watched an extended interview with the British director Steve McQueen, known for his use of resolutely, even unsettlingly, long takes in his films. In response to a question about a 17-and-a-half-minute long shot in his 2008 film Hunger, which features a dense and fiery conversation between the IRA hunger striker Bobby Sands and a priest, McQueen described the long shot, especially when it contains multiple characters, as one that demands a different kind of watching from its audiences. While conversations divided into close-ups project the location or meeting point of the conversation into the audience itself, the long, sustained, and wider shot requires the audience to project themselves into the scene, to acknowledge themselves as spectators and voyeurs and to make sense of that experience. In a way McQueen seems to be saying that in film the long shot is more radical and involving because it observes what we might call the fourth wall, while the broken up, sequenced shot is less so because it directs the story straight into the world of the audience member, obscuring any sense of theatrical divide. This seems somewhat at odds with how theatre historians and performance critics often understand the observation or ‘breaking’ of the fourth wall, but I suppose in a cinematic broadcast we are dealing with two frames of reference – the theatrical one and the cinematic one – and that we are in turn navigating a potentially double divide. What is the result? Well, the honest answer is that I still don’t entirely know, but my sense is that many theatrical broadcasts are dealing with it by trying to jump over and beyond it. 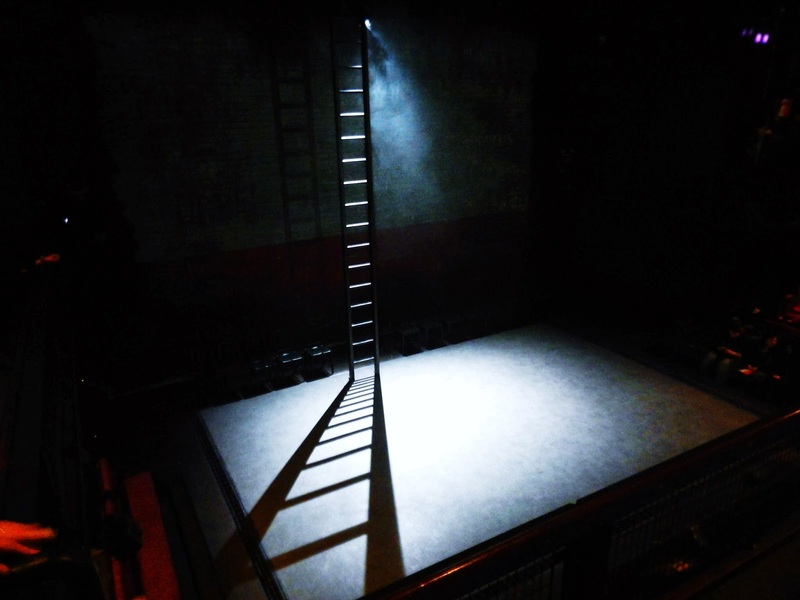 This Coriolanus was very intimate, even claustrophobic – though to be fair, the Donmar as a space is too, so wide or distant perspectives simply aren’t a part of the theatrical experience it offers. One thing that struck me throughout the broadcast was how so many of the full-stage shots came from either above or below eye-level, almost as if the camera had to back into the upper and lower crevices of the space in order to squeeze in the wider view. And while many shots tracked with the actors, few if any tracked through them – that is, moved through the stage space even if the actors themselves were more or less stationary (something I found especially compelling in the Richard II broadcast). Occasionally, we were treated to a level and fairly open view of the stage from one of the downstage corners, which for me were the most effective shots. With them I felt that I had a perspective that offered a fuller understanding of the theatrical space and the actors within it, without feeling so cramped or craned. But for the most part, the multi-angle close-up predominated, offering an emotional intimacy and naturalism that highlighted what seemed to me to be an especially and even excessively emotional Coriolanus. It was certainly unBrechtian in this regard – the constant approach was that of empathy, identification, interiority, with Coriolanus himself very much the victim and very little the enemy of the people. Haughty, yes, but more foolhardy than anything else. Tears were in abundance, and the camera worked hard to highlight them as much as possible – in the first domestic scene, close ups on Virgilia’s silent tears worked to sculpt a greater sense of character out of what is ultimately a very tiny part, and in the closing sequence Coriolanus’s own steady tears became the chief visual motif running through the supplications of his wife, child, friend, and mother. Perhaps it was the Coriolanus that this space, and this actor, demanded – in the interviews preceding the broadcast, Josie Rourke described the Donmar as ‘a deeply psychological space that has to be enormously truthful’, and for me Hiddleston’s very moving, very ‘truthful’ Coriolanus was most absorbing even when he was most outside what I think the part actually demands. It’s understandable, then, that the camera work in this broadcast sought to capture and even heighten these strengths, but I still couldn’t shake the feeling that I wanted the visual frame to slow down, and to back off. I wanted to see and explore more of the stage space on my own terms, to attend to Hiddleston’s powerful presence and even celebrity within the context of the whole theatre (audience included). I wanted the visual narrative to breathe. But maybe that’s not how this production worked, irrespective of the screen. The other week I did something unusual, at least for me – I saw the same Shakespeare production back-to-back, going to a Tuesday matinee and then a Wednesday evening performance. But this was repetition with a difference. While I attended the matinee performance of the Royal Shakespeare Company’s Richard II live and in person in Stratford-upon-Avon, I went to the Wednesday night show at a packed-out cinema in London, where they were live broadcasting a video transmission of David Tennant and Greg Doran’s take on Shakespeare’s historical tragedy. I’ve seen live broadcasts of theatre before, namely through the thriving NTLive series, but this is the first time I’ve seen the same production in person and in cinema, and it’s an experience that merits some reflection. The first thing I should say is that I was surprised by how similar the two were. And if that sounds daft, let me explain – having been fully converted to the mantra that theatre is different every night, I was struck by the care with which particular, and in some cases rather small, performance choices were reiterated almost identically across the two performances. Bushy drew his bare left foot in as Bolingbroke pronounced his supposed crimes and death sentence; the Duchess stared feverishly down the barrel of her husband’s coffin as she imagined Mowbray’s bloody death; and Richard and Aumerle laughed with perfectly replicated timing when the King offered to place the hollow crown on his friend-turned-lover’s head. But more importantly, and more pertinently for this response to the live broadcast, my sense of the overarching performance experience that emerged through a succession of camera angles and edits for the cinema screen in London very closely matched the one that I had perceived in-person in Stratford the day before. Perhaps this was due to an unconscious filling in of scenic and performance detail on my part – it would have been interesting, I think, to have seen the filmed version first, and then the in-person show, since one of my main difficulties with previous broadcast experiences has been a sense of confusion as to where particular characters are located on the stage, or indeed what the wider stage-space itself looks like. In Kenneth Branagh’s recent Macbeth, for instance, which I saw only via cinema broadcast, I found myself struggling at the outset to place the witches in the theatrical space, introduced to us as they were in tight close up. Had I also seen the Macbeth in-person the day before, I would have known that the witches came out of a door placed low in the side stage wall, irrespective of what the camera chose to show me. But that said, I’m fairly confident that this RSC broadcast presentation of Richard II, produced by John Wyver, mixed camera angles and perspectives in a more varied, measured, and – for me – satisfying way than in any live broadcast I’ve previously seen. Crucially, wide shots of not only the full stage space but also fringes of audience appeared frequently throughout the filming, and almost always at the start and close of every scene. This meant that as cinema audiences we had knowledge of the wider layout and use of the stage in each scene before we moved into more closely framed shots. In many live broadcasts, continuous close ups seem to be the norm, a tendency I can understand given how accustomed we as audiences are to getting this intimate perspective in television and film. But in live performance recording I often find it awkward, and even boring, especially when the shot is tightened to just the head and shoulders. While these shots give us unprecedented access to actors’ facial expressions, offering us a proximity not available even to in-person audience members seated in the front row, they also trap the actors’ bodies within the confines of the camera frame, imposing stasis on a moment that in the theatre is unbounded and alive with possibility. While the actors might not end up running across the stage at a moment’s notice, or falling suddenly and dramatically to the ground, there is still a sense in the theatre that they could. Very tight camera shots foreclose this possibility, imposing the stable mise-en-scène of the camera into the wider and indeed wilder stage-scape. In such shots the face to reigns supreme, and while I like faces, I also like other things too. While the Richard II recording had its fair share of close ups, frequently moving to this mode when the dialogue focused in on two characters (for instance, the goodbyes Gaunt and Bolingbroke exchange in Act 1 scene 3 after Richard banishes his cousin), the directors weren’t afraid to leave this mode and offer what I would describe as a more open, contingent, unpredictable – in a word, theatrical – point of view. Wide and mid-shots of the stage and characters were sensitively mixed with tighter close ups, creating a roving and fluid perspective that loosened its grip on the viewer’s gaze and recognised the fact that there’s more than one best seat or best perspective in any theatrical house. Most effective and exciting for me were the long tracking shots that started with a tight focus on a particular part of the stage-space and then slowly opened up to move across and through the wider scenic tableau. An example was Act 4 scene 1, when the Bishop of Carlisle challenges Bolingbroke’s assumption of the throne – starting with a tightly cropped shot of the Bishop and Bolingbroke towards the back of the stage space expressing their mutual displeasure with one another, the camera then pulled away to gradually reveal and weave through the half dozen other characters dotted across the stage and taking in this very public moment. Through this visual choreography we were able to focus in on two of the scene’s most central characters, but not at the expense of locking our view and erasing everyone else. Alongside what I am suggesting are more theatrical modes of engagement were also a few strikingly cinematic choices. The broadcast opened with an aerial shot of the Duchess slumped over her husband’s coffin, which then pulled away to show the wider stage space, and towards the end of the play the York family appeared at a distance in a long shot that transitioned into a slow, sweeping zoom into the scene. Perhaps most noticeable of all was the camera work offered during and after Richard’s capitulation to Bolingbroke’s demands in Act 3 scene 3. Here Doran’s production inserted a tender exchange between Richard and Aumerle that ended with a passionate kiss – arguably the most striking directorial choice in an otherwise rather stately and textually conservative production. In the in-person theatrical space we watched this moment between the two men unfold from their location on an elevated balcony, which crossed the stage’s proscenium arch; on film we saw it in close up, a framing that served to enhance the extreme intimacy of this illicit, and ultimately tragic, expression of love. With both men seated, the blocking itself dictated a stillness that the camera frame reiterated rather than imposed, further marking this moment as the true crux of Doran’s reading of the play. At the end of the scene, after Richard descended from the balcony to submit himself to Bolingbroke and follow him to London, the camera slowly tracked back up to the now-empty scene of the kiss, visually imprinting its significance once again in our minds through this focused direction of our gaze. While the points above don’t account for all the scattered thoughts and impressions I had about the cinema experience of Richard II, they pretty much cover the most salient, and significant points. There were, of course, a few minor glitches on the evening, including very live, echoey sound in the first scene and a half of the broadcast, and a couple of unfortunate relays of the stage work, such as a lost joke between Richard and the Queen when he commanded her to ‘Be merry’ as he departed for Ireland, and more significantly Northumberland’s announcement of Gaunt’s death from behind a rather sizeable chair. I had expected more moments in which the scale of acting for a live audience in a large theatre would feel awkward or overblown within a close camera frame, but aside from Green’s slightly over-ample stage blood and the Duchess of Gloucester’s very evacuative tears, there was little that seemed outsized on film. 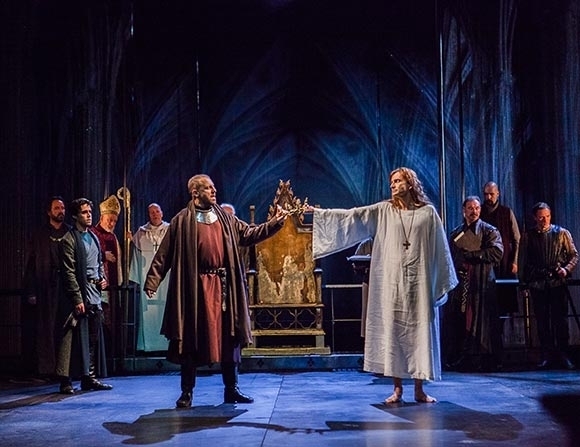 It was, all in all, a very thoughtful and responsive interpretation of the in-person stage performance I had seen the day before, and judging from a few comments on Twitter perhaps even a preferable version of it (one example – ‘#RSCRichardII live @cineworld tonight. Even better than when I saw it in Stratford bizarrely. Tennant mesmerising.’) While the stubbornly subjective question of ‘better’ will always depend on personal taste and context, the question of how audiences respond en masse to this new era of widespread theatre broadcasting – both in terms of general feedback and in terms of ticket sales – is one that will be of serious interest to theatres, arts programmers, funding bodies, and critics alike. It is, I think, the question with regards to where theatre-going and as a consequence theatre-making are headed in the coming years. Metatheatre indeed. 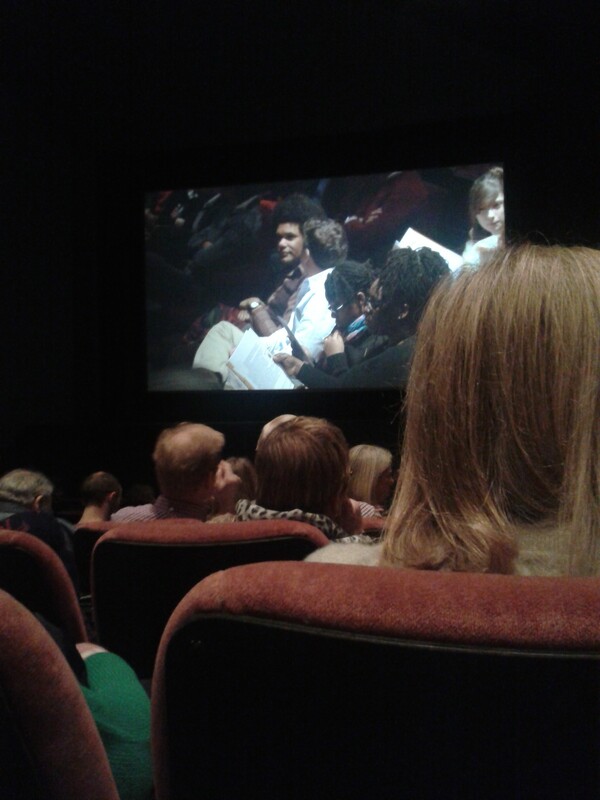 Richard II at the Renoir Cinema.